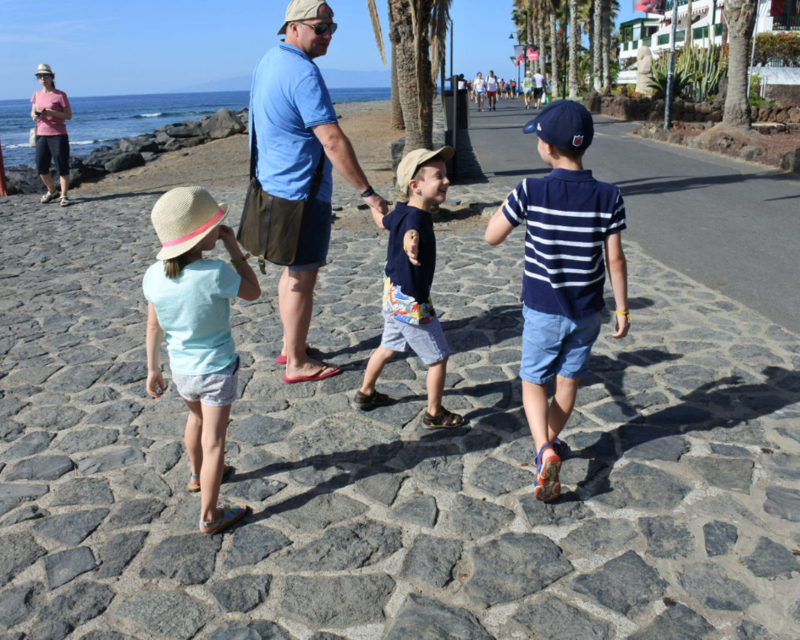 A few days after Christmas we headed out to Tenerife to see in the New Year and indulge in a bit of winter sun. 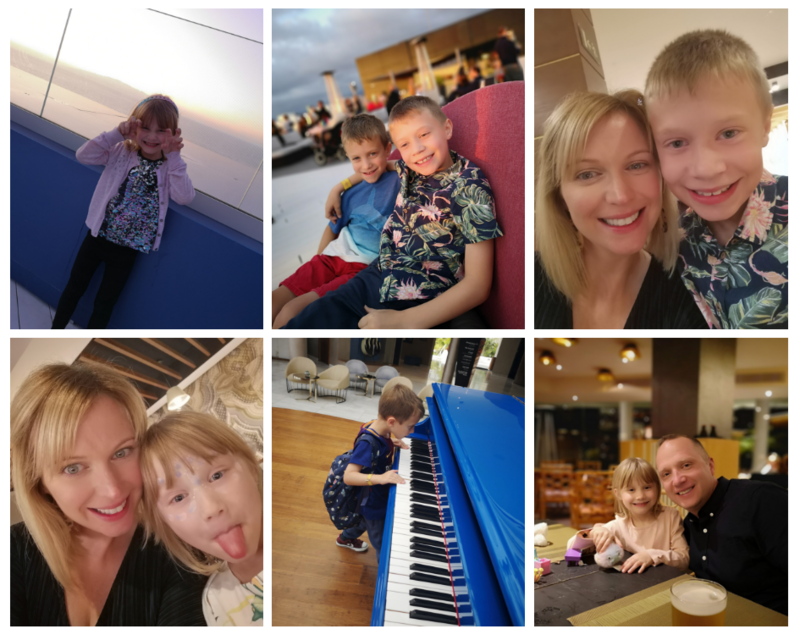 We stayed at the Hard Rock Hotel Tenerife. Here’s what we thought. 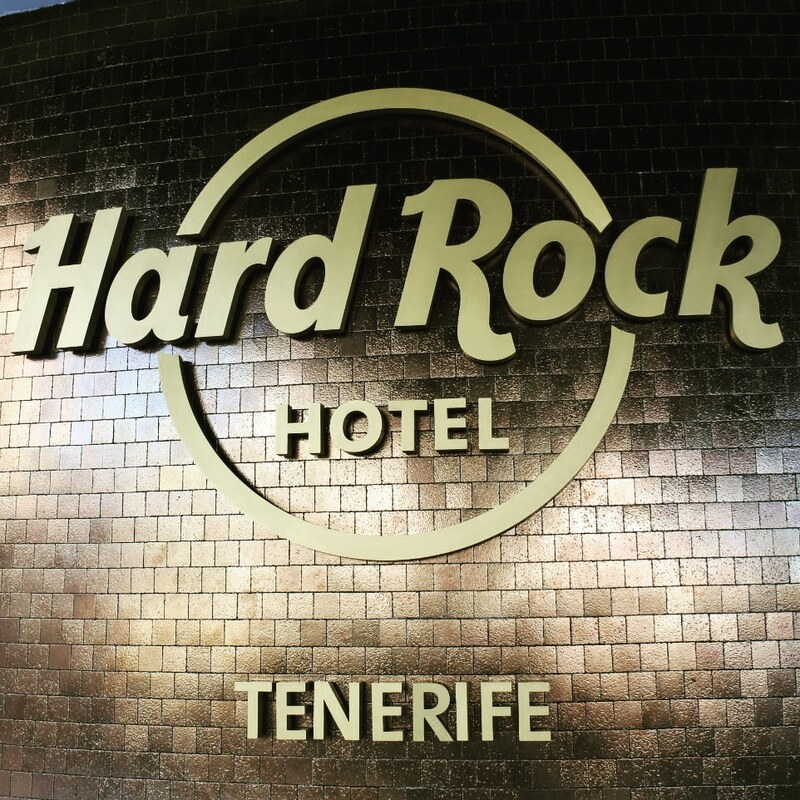 We booked the Hard Rock Hotel as a package deal with Jet2 Holidays. 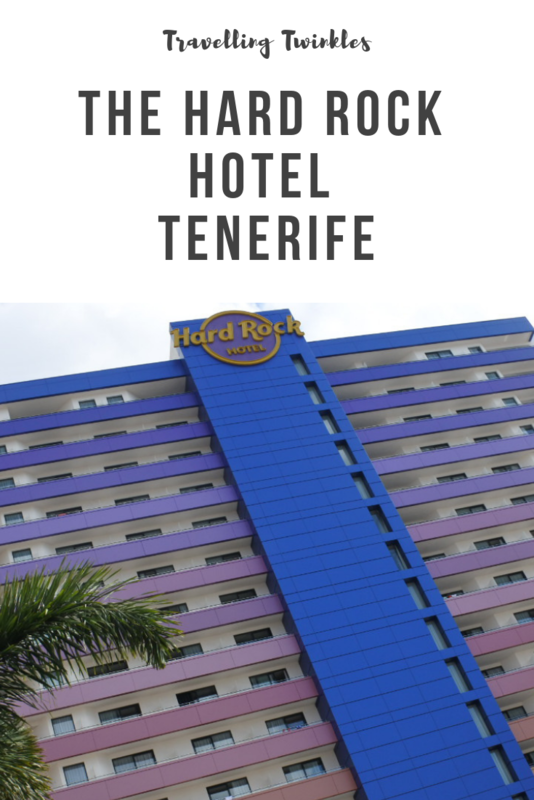 We’d spent a long time looking at various options, but kept coming back to the Hard Rock Hotel Tenerife. 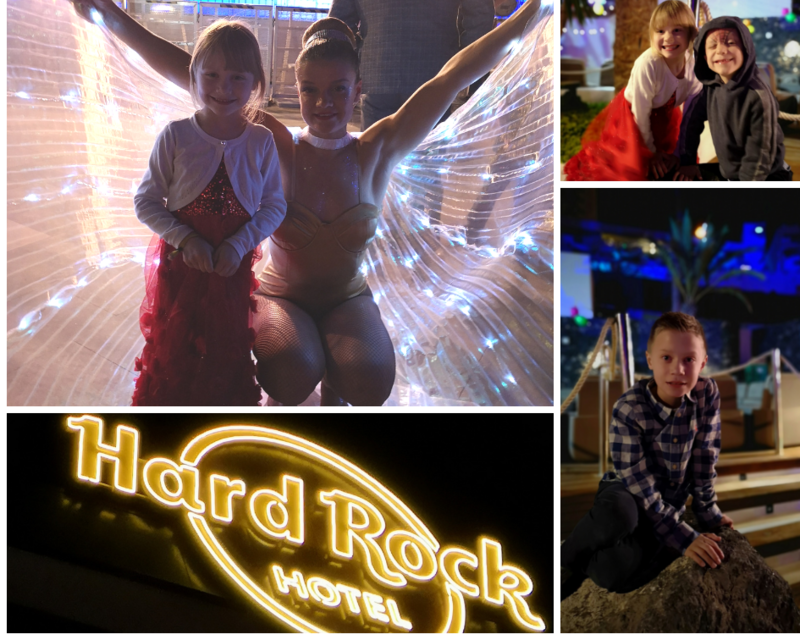 Initially, it was out of our price range, but during the summer (we were actually on our summer holiday at the time) Jet2 had an offer on and we were delighted when the Hard Rock was suddenly affordable. My mum and dad decided that they would join us too, which meant we could put Oscar in their room to avoid us having to book two rooms. We’re not huge fans of package holidays (at least we weren’t!) or at least the perception of package holidays. The idea of eating every meal at a buffet and having to fit for sun loungers is not really my idea of fun. However, our stay at the Hard Rock Tenerife has completely changed my view. Our flight was trouble free and upon arrival at the airport it was great to be ushered straight on to a bus and taken to the hotel. The hotel is situated about 30 minutes from the airport and we were the first stop, so it wasn’t long before we were dropped off. Upon arrival at the hotel we were ushered straight to the check in desk and almost immediately we knew it was going to be a great week. The Reception area is bright and the décor at the Hard Rock is absolutely lovely. We were offered a welcome ‘drink’, so the adults ordered G&Ts and the kids ordered orange. However, these weren’t your usual drink, they were actually little bubbles served in lollipop sticks. When you pop it in your mouth it explodes to release the fluid – really cool and very different. We arrived at the hotel at lunchtime, so only one of our rooms was ready, my mum and dad’s. Reception kept our cases and said they would call us when our room was ready. We went to my mum and dad’s (and Oscar’s) room to drop off their bags and then we decided to explore. 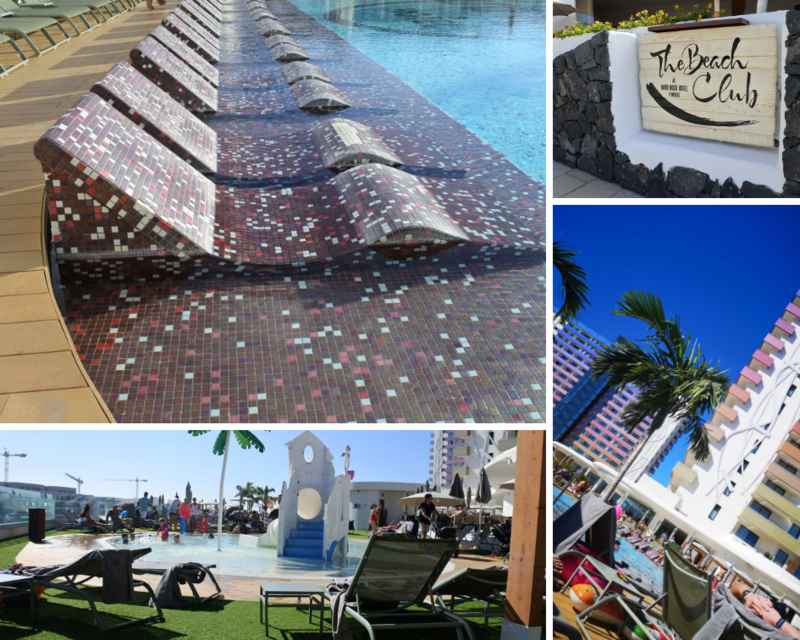 There are three pools at the Hard Rock Hotel, Tenerife. The main pool, an adults only pool and a pool, which is situated near the beach and is part of the hotel’s Beach Club. There was also a mini kids splash area. The pools were huge, with plenty of sun loungers, including a selection of day beds. We never had to fight for a lounger and tended to get loungers near the main pool or near the kids splash area. On our first day, we headed to the Beach Club pool where we did aqua aerobics, which was great fun. The pool was really freezing though, so I didn’t go in after this, but the kids didn’t seem to mind too much. Although I knew that the hotel had a kids club and park, I was still a bit worried that we might feel a bit out of place with the kids. However, I really shouldn’t have worried. 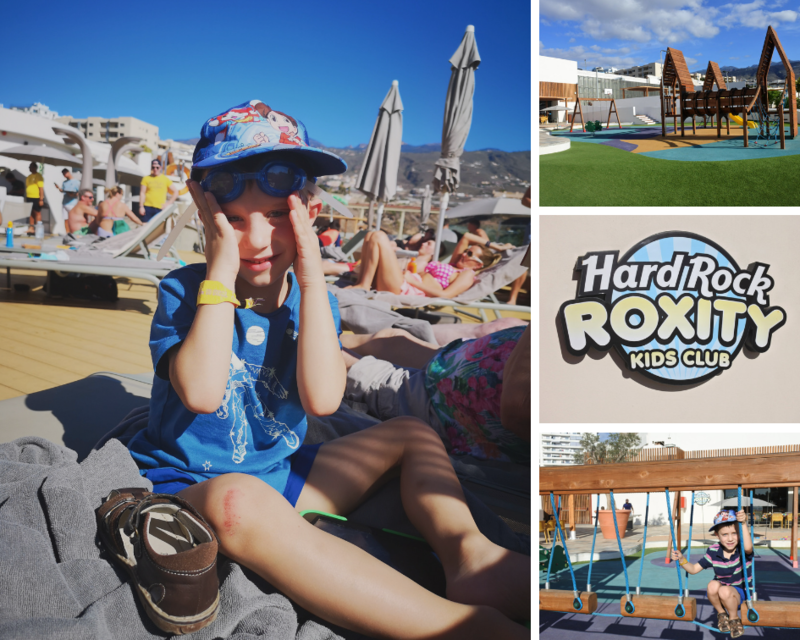 The Hard Rock Tenerife is absolutely perfect for families with kids. There are three kids clubs, Lullaby (from 6 months to 3 years), Roxity (from 4 to 9 years) which is where the twins would go and Teen Spirit, which is where Oscar tended to hang out. Officially Oscar should have gone in Roxity (he’s 9), but it was a little young for him and Teen Spirit suited him better and they were happy for him to go in there. The only thing about Teen Spirit, was that the kids could come and go as they wanted, which made me a little anxious. However, the hotel isn’t huge and there is CCTV everywhere. To help put us at ease, we gave Oscar a phone and got him to ring us whenever he wanted us to collect him, which he did. 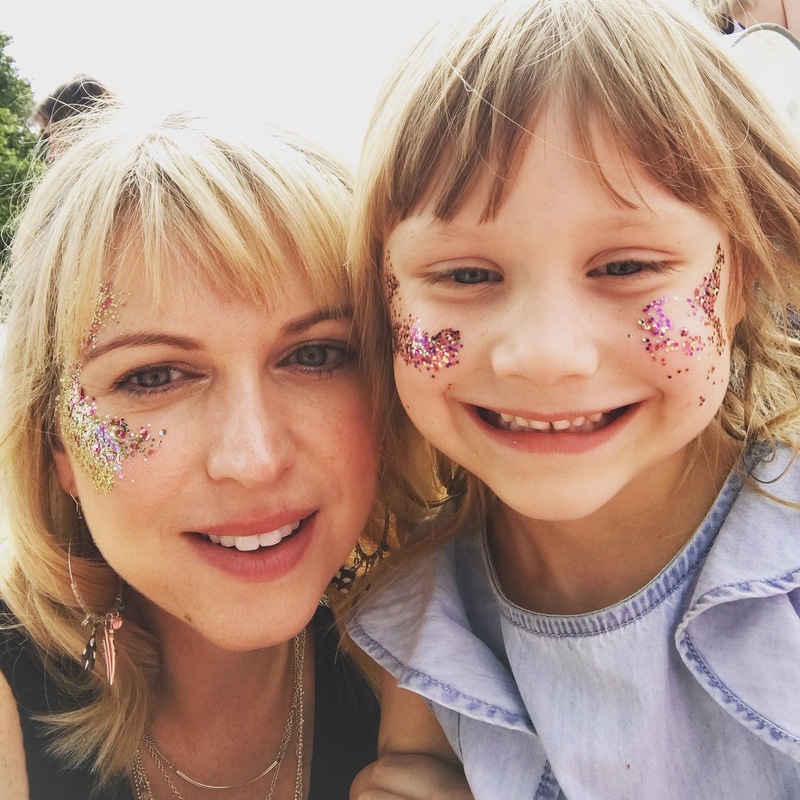 The twins loved Roxity and would go a couple of times a day for an hour to two, where they would do arts and crafts, face painting, shows and games. They particularly liked the mini disco, which was on every night from 6pm-7pm. We would drop them off for an hour whilst we had a drink before dinner, it was absolutely perfect! Teen Spirit was quite informal and the activities tended to focus on playing on Xboxes. 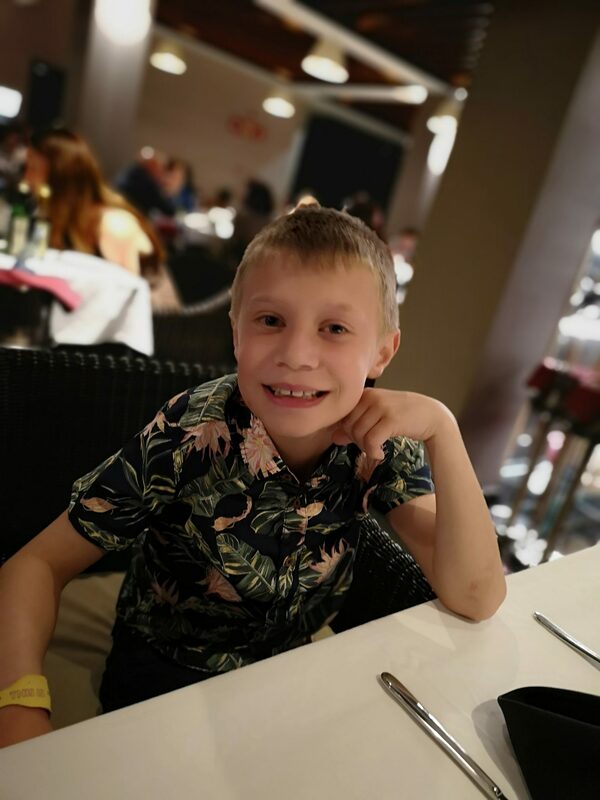 However, just near the kids clubs there’s a variety of sports facilities, including a table tennis table, a football pitch, a basketball court and a mini golf course, so Oscar would often play on these with some of the friends he’d met at Teen Spirit. There is a good selection of bars at the Hard Rock. We tended to sit outside in the evenings and watch the sunset over the ocean, whilst enjoying a cocktail. There’s a fantastic cocktail menu and the drinks are quite strong, so although quite expensive, they don’t skimp on the alcohol. 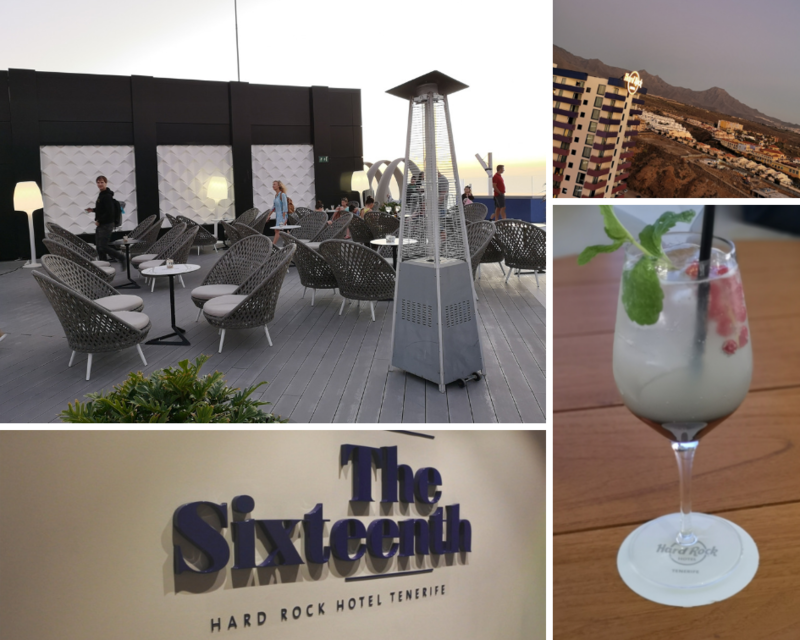 My favourite bar was The Sixteenth, which was on the roof of the Nirvana Tower. The sunsets were amazing and later on, they turn the music up a bit and it’s like a posh outdoor nightclub. It really was a fab place. The Hard Rock has a buffet, called sessions where we had a fab buffet breakfast every morning. There was literally something for everyone (including kebab and cheesecake!). Plus the Nespresso lattes were AMAZING! 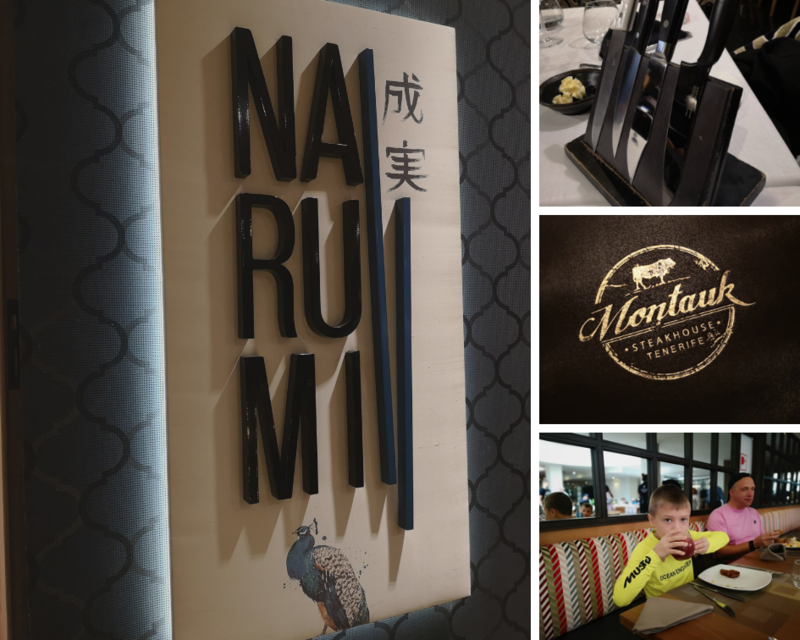 As we were half board, we had the option of either eating at the buffet for dinner or eating at one of the three restaurants where you received a €30 credit for each adult and a €15 for each child towards the bill. We ate at the buffet on two nights and were pleased with the selection, which included salads, pasta, pizza, meats and fishes, as well as some of the most amazing desserts I’ve ever had. There was also a kids buffet, which had nuggets, hot dogs, chips etc. One night we ate at the Tapas restaurant, which was lovely. The Spanish omelette and potatas bravas were particularly nice. We ate at the steak restaurant twice and the steaks were lovely and reasonably priced. There was also a great choice of side dishes including mac n cheese, which is one of my favourites. I also loved how you could pick your own steak knife, each knife was from a different country. We also ate at the sushi/Asian restaurant. Oscar and Simon love sushi so were in their element. I ordered Pad Thai, but didn’t particularly enjoy it. My mum had another noodle dish which she enjoyed and my dad had red thai curry, which he also enjoyed. I think I just chose the wrong dish. The twins had tempura chicken with rice, which seemed to go down well. We also ordered some gyoza, which were lovely. The food available around the pool was also really and included pizzas, burgers, salads etc. We tended to have a snack about 3pm each day. There was also a selection of sandwiches available at the coffee shop, which I thought were really reasonably priced. Both rooms were in the Oasis Tower, which is the main part of the hotel. My mum and dad’s room was ready first when we checked in and we were really impressed with it. The sinks in the room are pretty cool and the décor is lovely. There was a small bed for Oscar too. 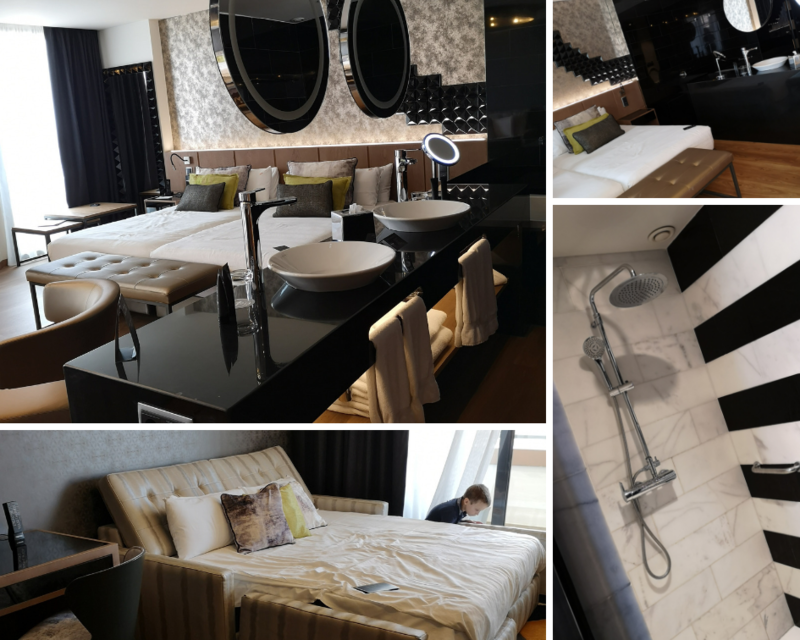 However, as we had the twins in our room, we were allocated a gold suite and all I can say is wow! The room was absolutely huge, with a nice big balcony (which we didn’t really use as I always get a bit anxious about balconies with the kids). Again, the sinks were in the room and we also had a gigantic whirlpool bath in our room too, which the twins loved. The walk in shower was also pretty special. It’s definitely one of the nicest rooms I’ve ever stayed in and the beds were super comfy. One of the things that I wasn’t really expected was how nice the hallways smelt. It’s probably quite a bizarre thing to mention, but whenever I stepped out of the lift to go to the room, the smell was amazing. I’m not sure how we manage it, but it’s pretty nice. We’re definitely not ones for cabaret shows and bingo, so the laid back entertainment suited us just fine. There tended to be a couple of pool aerobics sessions everyday, plus every so often a dj or musician would do a few songs round the pool, in quite a subtle way. 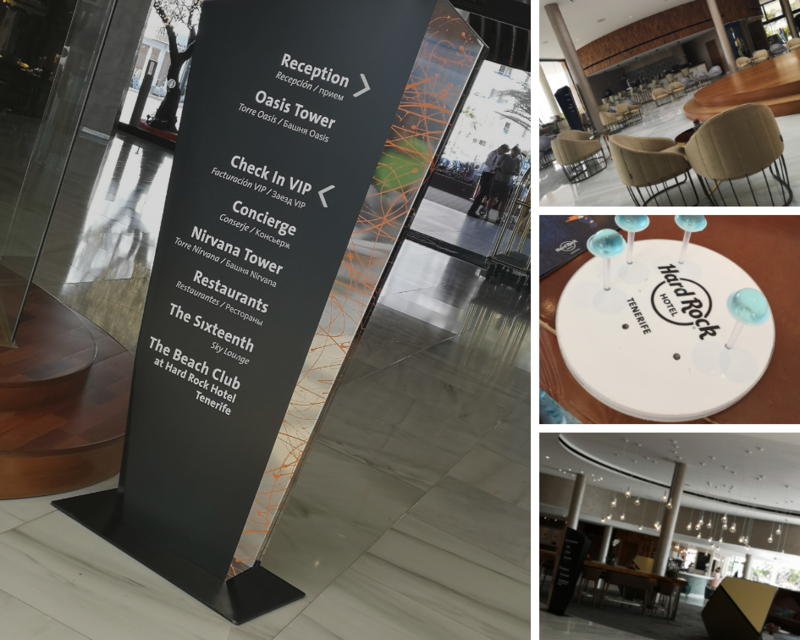 In the evening there would be an entertainer in the main foyer, in The Sixteenth bar and at the outside area where you could dine if you ate at the buffet. We were staying at the Hard Rock over New Year. On New Years Eve, everyone staying at the hotel, regardless of what board basis they were on, was invited to attend a complementary 7-course gala dinner with entertainment. The evening was pretty special and we felt like we were Hollywood celebs – it was very glam. The Havana theme was pretty cool and the entertainment was brilliant and consisted of amazing musicians, dancers and acrobats. The food, was a little too posh for my liking and I thought some of the courses were a bit strange. The wine pairings were amazing though and they certainly didn’t skimp. The fireworks at midnight were really impressive too. We headed to bed soon after, as the kids were shattered. The party continued well into the early hours though and was no doubt pretty amazing. The service at the Hard Rock is brilliant. I’d probably describe it as attentive, but not intrusive. 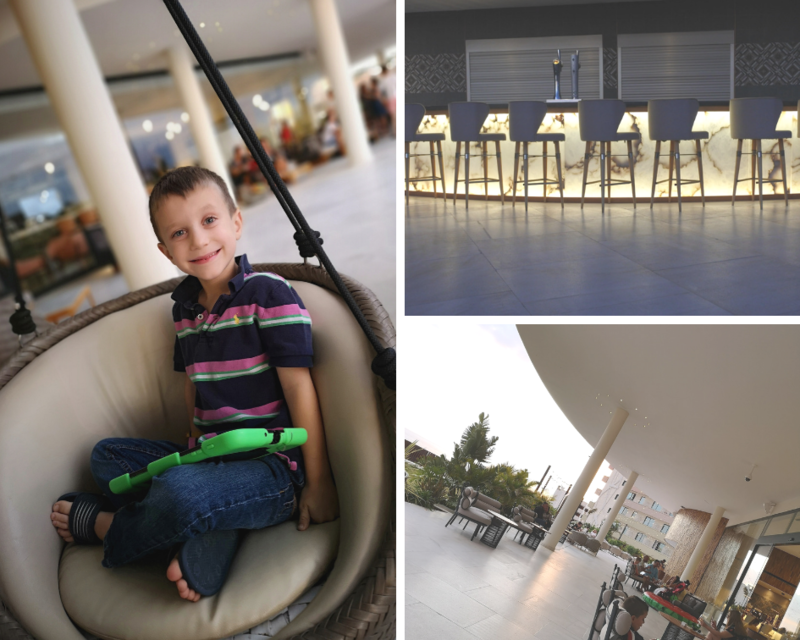 There are plenty of waiters around the pool so that you can order food and drinks without ever having to leave your lounger, which is always a bonus. One night Heidi was ill, so I stayed in our room with her. We’d booked to go to the tapas restaurant that night. The rest of our group went and the restaurant sent me tapas room service, which I thought was pretty fab. There’s not really much near to the hotel. There are a couple of tacky bars and restaurants and a couple of shops, which were handy for picking up water and snacks for the kids. The hotel ran a shuttle bus a couple of times a day to Siam Park and Playa de Las Americas, which we visited one day. We had a lovely walk along the beach, had some lunch and did a bit of souvenir shopping. I also picked up a dress from Mango for a bargain €9! It was nice to have a little wander, but the hotel was so fab that we didn’t really feel the need to head any further. Our main aim was to relax and that’s exactly what we did! I’ve heard Siam Park is an amazing waterpark, but as it wasn’t really hot we were worried that they may get cold and wouldn’t last the day and it’s quite expensive to get in and we didn’t want to waste our money. If we go back, I’d like to give it a try though. 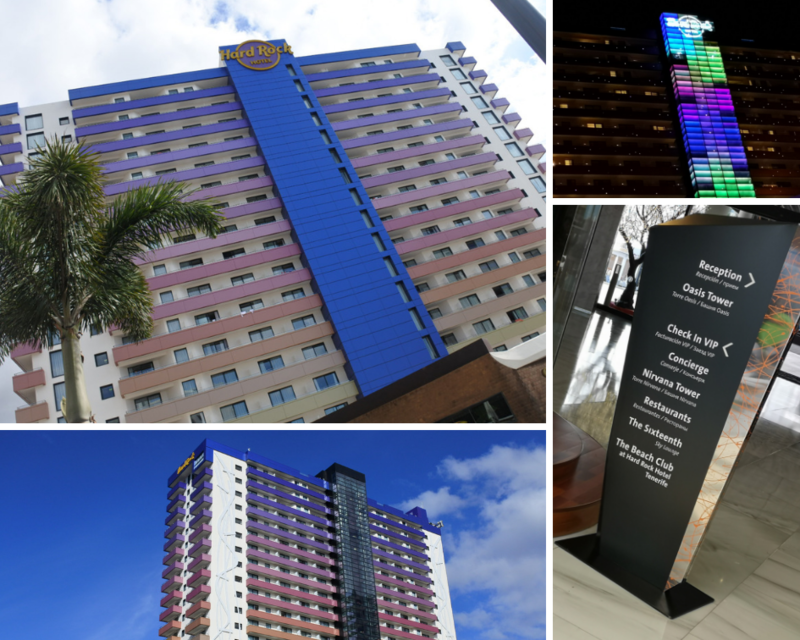 We really loved the Hard Rock Hotel. The atmosphere was brilliant and is really quite hard to describe. I’d read reviews that there’s music playing everywhere and I was a little worried that my mum and dad might not appreciate it. However, it was too loud or intrusive, it just complimenting the atmosphere. In fact, it made me realise just how much I love listening to a whole range of different music. All the memorabilia was pretty cool too. With it being December, we were worried about the weather. However, it was perfect. Everyday the sun was out and the temperature was around 20 degree Celsius. It would get a little chilly at night, so it’s definitely worth packing a cardigan or a light jacket. It would occasionally be a bit of the breezy side during the day, but nothing too bad. It was so lovely having some winter sun and was just what we all needed after the chaos of Christmas. 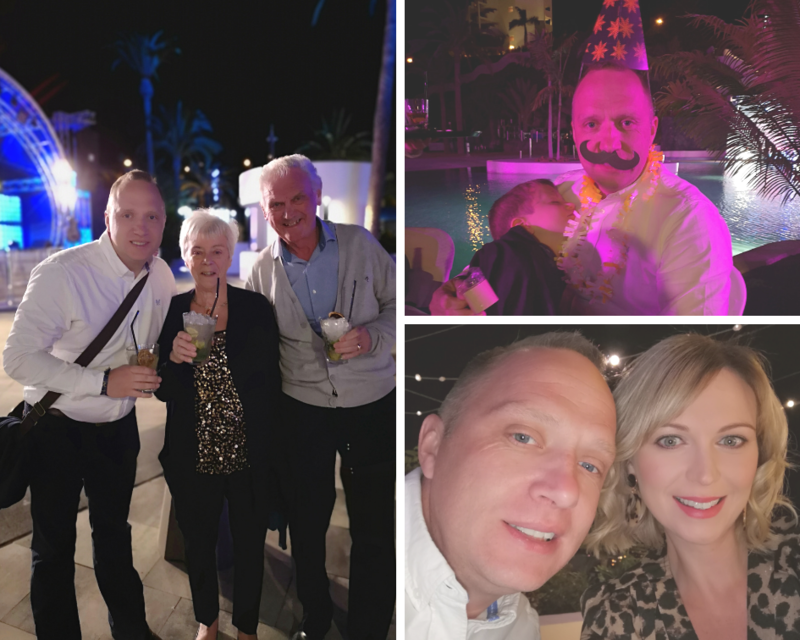 The Hard Rock Hotel, Tenerife is perfect for both families and couples and I really hope we get to go back in the future. We did lots of filming during our stay, which I’m planning to edit into a video. I’ll upload it here once it’s finished if you fancy a peek. I read your review on the Hard Rock Hotel and thought that you had a great stay there!!! The manner you described your first sight of the hotel gives me an ideas what does it look like. As you mentioned above, the staff are brillant and there is a wide range of choice while having a buffet at the restaurant. Finally, the outside of the hotel is nice and calm as i saw on the picture. Would love to have a stay there, one day!! Thanks for your post. What a fabulous places to stay! An d what an experience to stay over New Year. Thanks for linking up to #fearlessfamtrav.